How to configure SimpleTelly on your Linksys Static Route. Certain devices such as the Google Chromecast have built in DNS settings designed to redirect all DNS queries to a particular server. To circumvent this, we'll need to set up a static route on your router that will instead push all DNS queries to use SimpleTelly DNS. From our experience, the best routers that give you full customisation are DDWRT and RouterOS based routers. In this tutorial, we'll walk you through setting up a static route that is available on a much wider range of routers and will work in the same way as a custom firewall rule. Note: While these instructions were written based on LinksysE1200, the principal should be the same for other models / versions of Linksys router. Take note of the fastest DNS server addresses that appear on screen. Now open another tab or window in your browser and type in http://192.168.1.1/ to access the Configuration page for your Linksys router. Please note that while the default IP address should be the same as what is written above, yours may be different, so please refer to your router manual if yours does not respond to the IP address above. 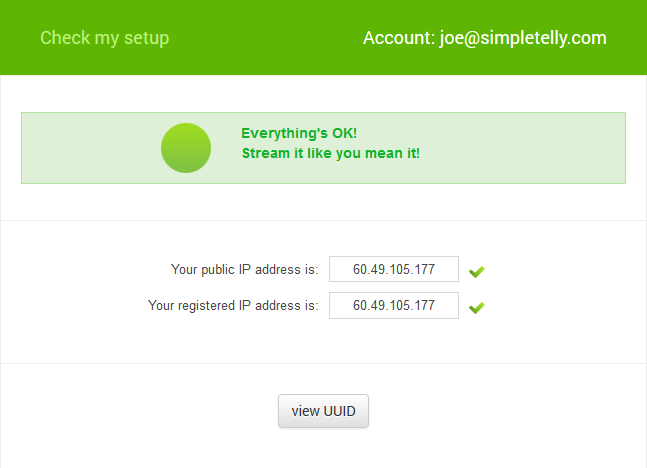 Now go to the Network Setup section on the main screen and enter the DNS addresses that you see in your Client Area. Next, please click on Advanced Routing which can be found on the top banner. Once that is done, click on Save Settings and select the next route entry to edit. Once the information above has been entered, please click Save Settings and reboot your router. Now that the settings have been confirmed, any device that re-routes to Google's DNS servers will be pushed through SimpleTelly instead. Once you have done that, go back to your account page and click on Check My Setup. If this is the first computer you have setup from this location, you will probably need to register your current IP address. Click on Register your new IP address. Now that you have set up and registered your system you can go ahead and access the TV site of your choice on Roku or For the full list of supported channels, please refer to our Supported Services page.